Are we spreading the word about Jesus, like the shepherds who were the very first to give witness of him? They were told by an angel that a Savior, the long awaited Messiah was born. They were told where they could find him and how they would recognize him — in Bethlehem, wrapped in swaddling cloths and lying in an animal’s feeding trough. God chose shepherds, one of the humblest of occupations at the time, to be the news media of the day to spread the word about God becoming one of us through the cooperation of an unknown teenage girl in a remote area of the world in the most humbling of circumstances. We can only imagine the reaction of Mary and Joseph to having some shepherds, complete strangers, visit them and share a story that confirmed what they, too, had been told by an angel – that the son born to Mary was the son of God, Savior and Messiah. The news of a savior of the world being born is of course pretty amazing stuff. The good news the Shepherds first proclaimed 2000 years ago is just as important to the world today as it was then. A savior has been born! The creator has become one of his created! An anointed one has come and is present to reconcile God and humankind, and humankind with one another. Through the power of the Holy Spirit, this savior offers to dwell in us, to be present to us and enable us to be and bring his presence to the people and circumstances in our lives. Like the shepherds, we may consider ourselves unlikely heralds that Jesus is still present in the world today. He is present to all who accept his offer to dwell in them. Like the shepherds, we also have the opportunity to spread the word about Jesus in what we have seen, heard, and experienced. This entry was posted in Uncategorized on December 29, 2014 by stevedalgetty1. This entry was posted in Uncategorized on December 22, 2014 by stevedalgetty1. How ironic! Jesus experienced rejection even before he was born. “She wrapped him in cloths and placed him in a manger, because there was no room for them in the inn.” (Luke 2:7) There was no room for Jesus in the inn, so Mary and Joseph had to settle for a cave that was used as a stable for animals. While these circumstances may have served God’s purpose in taking on our humanity in the humblest of settings, you have to wonder what the innkeeper might have done had he known who Mary and Joseph were and what was about to happen. We should not be too harsh in judging the innkeeper, for how often have we failed to make room for Jesus in our lives? There have been times in my life when I made more room for my career than I did for Jesus. 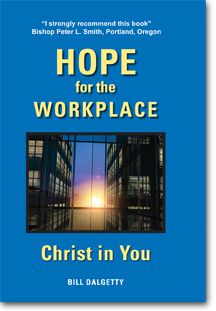 There have been other times, when, like the innkeeper, I did not recognize Jesus in a colleague looking for someone to talk to or the street person looking for help on the streets of New York. The good news is that God never ceases to give us opportunities to make room for him through his son, Jesus. He is always inviting us to open the door of our hearts so he can reproduce himself in us through the power of the Holy Spirit. He is always inviting us to love, to forgive, to serve — to build his Kingdom on this earth in the daily circumstances of our lives. As we celebrate the day when the God of all creation became one of us at a specific time and place in order to change our lives and the course of history, let us renew our yes to him, our yes to Jesus and our yes to the power of the Holy Spirit in our lives. Am I making room for Jesus today in how I relate to my spouse, my children, my colleagues at work and the stranger for whom there is no room in the inn? This entry was posted in Uncategorized on December 15, 2014 by stevedalgetty1. Do we appreciate the gift of freedom that God has given us? How precious is the gift of freedom which God gives to each of us! He preserves it even in the midst of his most important act after creation – his incarnation – the intention to become one of his created in order to overcome evil and save the world from its pattern of acting outside his desire and plan. We honor and revere Mary for her decision of faithfulness and obedience to God’s desire. As we read Luke, we may tend to gloss over all of the real and practical complications, second guessing, and judgments Mary must have endured in saying yes to God’s messenger. Even Joseph intended to divorce her until God spoke to him in a dream. Like Mary and Jesus, God has given us the freedom to make choices. Several years ago I was offered a promotion in my work that would have required our family to move. Everything in my work experience was calling out to me to accept this apparent advance in my career, but my wife and I discerned that it was not God’s will for us. We will never know what might have happened had I accepted the new position, but we do know what has happened – an apparent initial sacrifice was transformed into a cup overflowing with a multitude of blessings over many years for our Christian family of five children that has now evolved into four additional Christian families and thirteen grandchildren. How will we use this freedom God gives us? Will it reflect love and faithfulness to God and the people he puts in our lives along with the blessings that follow, or will it reflect the epitaph that “I did it my way” and the “success” that follows in the eyes of the world? This entry was posted in Uncategorized on December 8, 2014 by stevedalgetty1. Do present circumstances discourage you from praying for the desires of your heart? Zechariah and Elizabeth were unable to have children, but apparently their prayers for a child continued, even into their old age. While Zechariah was serving in the Temple, the angel, Gabriel appeared to him and said, “Zechariah, your prayer has been heard. Your wife Elizabeth will bear you a son.” (Luke 1:13) He went on to say that this son will be great in the sight of the Lord, filled with the Holy Spirit and bring many people back to the Lord. Although Zechariah had been praying for a son for many years, his present circumstances caused him to question whether this could still happen. He asked, “How can I be sure of this? I am an old man and my wife is well along in years.” Even Gabriel acknowledged Elizabeth’s advanced age in Luke 1:36. While Zechariah’s doubt rendered him unable to speak until the promise was fulfilled, his faithfulness in serving the Lord and persistence in prayer over many years was rewarded with the birth of a son, John the Baptist, whose mission was to prepare the way for God’s own son. Zechariah and Elizabeth are great models for us. They remained faithful and persistent in their prayer over many years and even after the answer to their prayer seemed impossible. Our daughter, Emily who is now 28, was born with Down syndrome and a speech disability. For more than 20 years we have been praying for the healing of her speech disability so that she could be better understood and able to interact more fully with others. Like Zechariah and Elizabeth, the present circumstances may indicate that not much is happening, but we have seen some progress in her increased efforts to converse, and we will never cease praying in faith for God’s special intervention in the life of this special child entrusted to our family. While we may struggle to know the mind of God, the fact that something may appear impossible is not a reason to refrain from praying for the desire of our hearts. This entry was posted in Uncategorized on December 1, 2014 by stevedalgetty1.